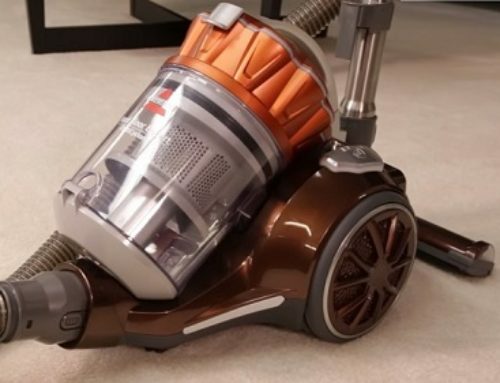 Today, we’re taking a look at the BISSELL Hard Floor Expert Bagless Canister Vacuum 1154. This canister vacuum is 19.2 inches long and 15 inches tall. Also, the vacuum is 12.9 inches wide at its widest point and weighs 9.3 pounds. The BISSELL Hard Floor Expert comes with a variety of different cleaning tools. First, we have the crevice tool, not tremendously long but gets the job done when you combine it with the hose. We also have the dusting brush, a similar length, bristles of medium firmness. And both of those are housed on this little piece of plastic which simply attaches to the hose up at the top of the main connection point. Next, we have the hard surface tool. This tool has these spinning brushes great for polishing those hard surfaces as well as picking up finer debris. And then, lastly, we have the carpet cleaning head. It does still have protective little felt pads there if you do end up using this on more delicate surfaces. Additionally, you have the extendable brush heads that can be activated with this button. Simply press that and that presses the bristle brushes out so you can actually also use this on hard surfaces that are a bit more delicate where you don’t want the spinning brush. Cleaning performance on our hardwood test was a little bit hit or miss and we saw some surprises as well. Since we were on hardwood, we used the recommended tool which is the hard surface cleaner. This tool, of course, has these rotating bristle brushes. We found that these rotating bristle brushes were a little bit better suited to just polishing those hard surfaces as opposed to actually picking up debris. During our cleaning tests, when we used that hard surface cleaning head, we saw that rice struggled a little bit, but cereal was a significant struggle and really was not able to be removed very successfully at all. However, we always trying to do our due diligence so we did rerun those tests using the multi surface cleaner, which is great for lots of different services as well as carpet and upholstery, and it did much, much better, removing nearly all the debris for both of those tests. Our tests for both low and high pile carpet were actually quite good. 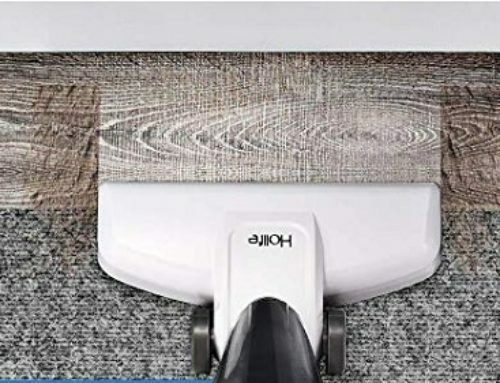 For those tests, of course, we used the standard multi surface/carpeted cleaning head and both those tests were nearly flawless from top to bottom on all eight of our cleaning tests. The BISSELL 1154 canister vacuum includes a cord that is 18 feet long and it also includes this retractable cord feature. I can pull this all the way out and I just push this button down, it flies back in. We do recommend, if you use that cord retractor, use that with your feet or otherwise keep your face far away from it. The hose on this vacuum is around 7 feet long so you get pretty good length there and we also have the extendable wand right here in its shortest version is about 2 feet long but it does extend to approximately 4 feet long. The BISSELL Hard Floor Expert 1154 is 9.3 pounds, and additionally, it has fairly sturdy wheels for pulling it around behind you. Maintenance on the Hard Floor Expert is fairly straightforward. However, it’s a little bit more on the pricey side. Depending on how often you vacuum, annual maintenance will cost anywhere from around $44 up to as much as $88 per year. That annual maintenance covers two filters that need to be replaced periodically. The first is the dust cup filter. To get at that, you simply remove the dust canister. You open the dust canister up. And then you see that filter right there. Installing the filter is quite simple and simply sits on top of the dust cup section and then locks into place. And to empty the dustbin, you simply press this button along the bottom and it empties out the contents. The other filter is the post-motor filter and it is held behind the wheel. To get to that filter, we simply rotate the hubcap portion of the wheel off, it pops out, and then we also rotate counterclockwise this filter which allows it to be disengaged from its housing. All our vacuum cleaner reviews go through our standard noise test. To complete this test, we test the vacuum in a standard bedroom that has carpeted floors and we use a sound meter to measure the noise in terms of decibels. This vacuum came in a little bit on the louder side at 77 decibels. Overall, we definitely feel like this vacuum has a lot to offer. The overall build quality of this unit feels very solid, but especially the steel extendable wand. Having a completely steel wand is not something we’ve seen in many vacuums around this price range. I also like the number of accessories and cleaning heads that come with this vacuum, having a multi surface tool and also the hard surface tool to help polish those floors is definitely a nice extra as well. Lastly, the retractable cord is another really cool extra and not something you see on very many vacuums. The biggest con that comes with the BISSELL Hard Floor Expert Bagless Canister Vacuum 1154 is simply the maintenance cost. 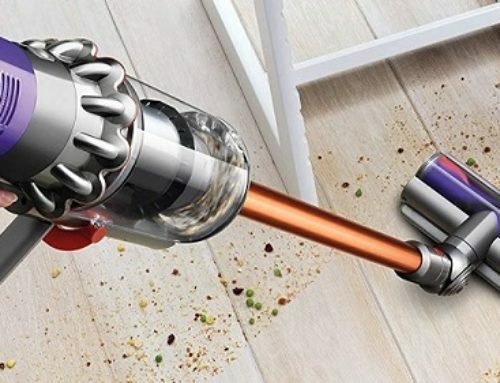 This vacuum comes in with annual maintenance between $44 and $88 a year, depending on how often you’re vacuuming.